Beer in one hand and chocolate in the other? Never! That’s always been my unshakable view. So Rupert Ponsonby, the ultimate beer persuader, had a challenge on his hands. With the front door of the Rococo shop firmly locked up for the night, we go downstairs and the class begins. Greed is encouraged from the outset. Things could get messy. There is ample beer lined-up, and there is exquisite chocolate in whimsical packages stacked up high. The long table is covered in Rococo’s signature print cloth - it would make a cheery duvet cover. Immediately, you’re in a cocoon of comfort. Rupert has chosen six beers to match six types of chocolate. These big-boy beers are not session pints and deserve contemplation in their own right. Duvel Belgian golden ale 8.5% abv – with a bold head, hints of clove; light bodied and zesty. Hogs Back traditional English ale 4.2% abv – malty and sweet toffee flavours. 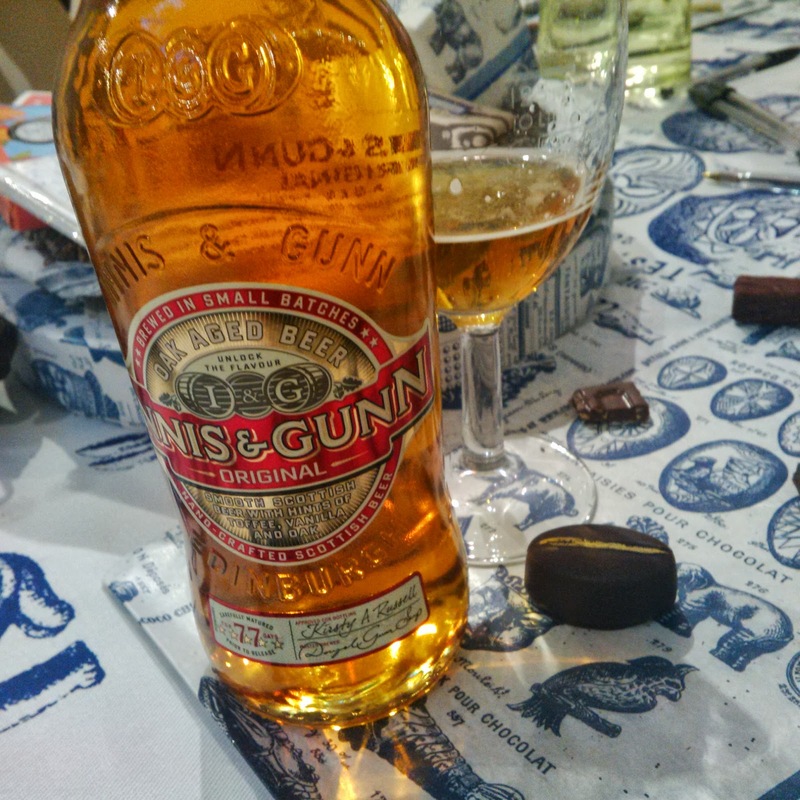 Innis & Gunn Original 6.6% abv – this Scottish oak aged beer has deeper tones of malt, with pronounced vanilla and oak. Innis & Gunn bourbon stout 7.4% abv – more bitter; dark and intense. Mr Trotter’s Great British chestnut ale 4% abv – made with chestnuts and sweet Maris Otter barley, giving a nutty creaminess. Liefmans cuvee brut 6% abv – refreshing sour cherry, with a stoney marzipan finish. Rupert prescribes a match with an array of chocolate; all so different in texture, intensity and flavour. There are potentially 36 beer and chocolate combinations in this feast, but that would make it too much like hard work. A good match has to excite the palate. Other than that, the intensity of the beer should equal the intensity of the chocolate, but flavours mustn’t be so similar so as to go head-to-head. Every sip of beer should merge completely with the chocolate as it melts in your mouth. As in wine tasting, aeration in the mouth helps you sense every nuance of taste – if such a treat as a gourmet Aero bar existed, then we want to test it. The process tonight deserves slow enjoyment and random re-tastes of beers and chocs. The time comes to name favourites. I vote for the Innis & Gunn Original with the sea salted caramel ganache. For me, this is all about silky textures, punchy flavours, and the familiarity of savouriness. Perhaps I was really hankering after a more conventional marriage of ale & a packet of crisps? But rather, I prefer to think I’ve now learned a thing or two about the quirky joys of matching beer & choc. 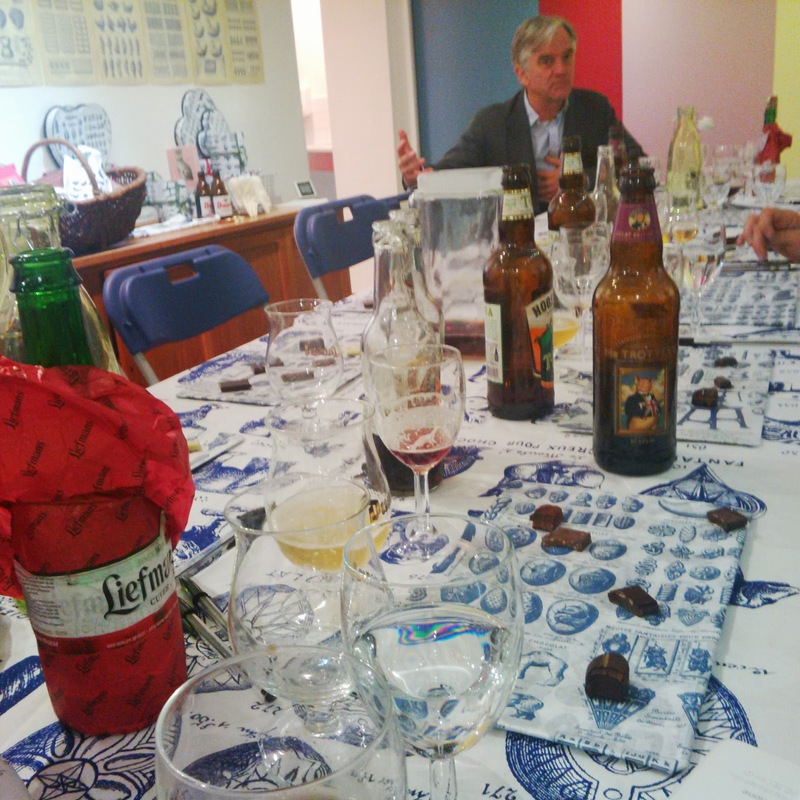 Su-Lin Ong (@sloLondon) drank beer at chocolate school on behalf of The London Foodie as a guest of Rupert Ponsonby, Rococo, R&R.